Health systems across the country have made a commitment to improving the consumer experience —90% of leaders in a recent Kaufmann Hall survey said this was a top strategic priority—but ongoing barriers have hindered better access to care. In fact, patients still frequently encounter appointment wait times of weeks or months; in fact, wait times in the U.S. have actually increased 30% since 2014. At Kyruus, we’re focused on solving what we call the associated “patient access paradox”–a situation in which patients wait long periods to see providers while appointment capacity simultaneously goes unutilized, even at top health systems. More colloquially, this phenomenon reflects a pervasive “Dr. Famous problem” in which those booking appointments for patients have limited or unreliable information about who is in the provider network and, thus, default to familiar providers whose schedules are naturally booked up far in advance. Without better insight into who’s in the network, where they’re located, what they specialize in, and so on, it’s difficult for call center agents, for example, to pair patients with providers well-positioned to meet their needs and see them sooner. For health systems, the result is over-, under-, or mis-utilized provider schedules, an overarching supply-demand misalignment, and challenges with patient acquisition, conversion, and retention. At the heart of the patient access paradox is poor provider data. This spans not only gaps in information about providers’ clinical areas of focus, but also a range of other essential patient-provider matching criteria, such as appointment availability, insurance accepted, locations, and age groups seen. All too often, this information is siloed and housed in static files that rapidly become out-of-date. The result is not only a reliance on a subset of providers, but also the common situation where consumers encounter discrepancies between what they find online and what they discover when they call in (e.g., “that provider no longer practices at that location”). Worse yet, they can end up booking an appointment but later find it’s with a provider who isn’t the right match for their needs. Without access to robust provider information and actionable workflows, agents and others cannot effectively convert patient interest to booked appointments, impeding a positive patient experience and making the health system more vulnerable to competitors. The reality is that healthcare consumer expectations are only rising, as are their options for where to receive care. To keep up, health systems must position themselves to account for consumers’ multi-faceted criteria around care decisions; for example, in a recent survey of 1,000 consumers, 70% or more of respondents rated all of the following extremely or very important in provider selection: insurance, clinical expertise, reputation of hospital/health system, appointment availability, location, bedside manner, and cost. Health systems not only need to be able to match patients based on complex criteria, but also ensure they are enabling this to happen regardless of whether a patient books online, calls in, or obtains a referral. The above survey also found that consumers not only have varied preferences around means of access, but are also likely to engage with multiple access points for a single appointment. For example, while more than half conduct online provider research, phone-based booking remains the preferred option for almost 60% of consumers. Thus, improving the patient experience and routing them to the right providers requires a holistic approach to access. Kyruus fundamentally believes that transforming patient access requires a multi-channel approach and that this starts with robust provider data. Thus, our solution starts with our provider data management platform, KyruusOne, which gives health systems a single point of access to provider data. In addition to integrating and standardizing disparate data sources, KyruusOne makes it easy for providers to stipulate their clinical areas of focus in detail—leveraging our proprietary clinical taxonomy—to pave the way for better patient-provider matching. 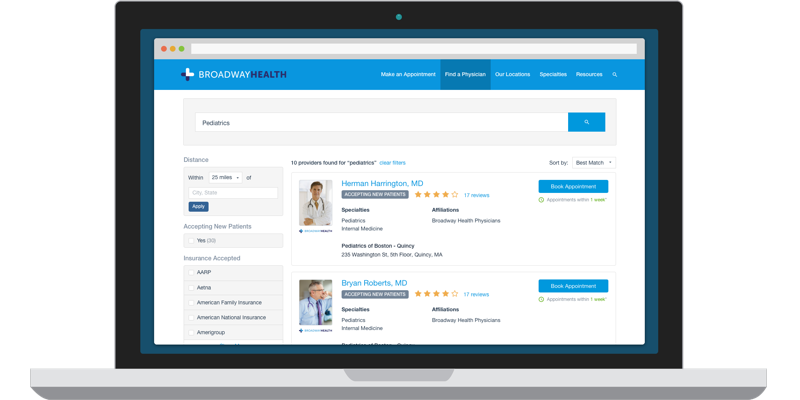 This data then powers the ProviderMatch suite of provider search and scheduling applications with consistent provider information that is easily searchable. Once the end user hones in on the right provider, our integrations with leading EHRs allow for direct appointment booking, enabling a seamless search and scheduling experience. But implementing a technology platform to expand and deliver new forms of patient access is only part of the equation. Our customers are also on a change management journey within their organizations to enable next-generation patient access initiatives. That journey starts with provider engagement. Health systems have spent considerable time and money around their patient data to ensure it’s available and accurate in every workflow to drive high-quality care. The wave of change management we collaborate on focuses on accurate and unified provider data and the ability to make schedules more accessible to key stakeholders, spanning both health system staff and consumers directly. Balancing the needs of providers and their satisfaction with the drive for openness and better access takes a measured and iterative approach to ensure success. We focus on showing results with a subset of providers and then help our customers expand across their enterprise, being able to point to previous successes to ease concerns and onboard more of their populations. Our analytics play a critical role in this, showing both clinical leadership and individual providers the impact of configuring their profiles optimally and allowing for direct scheduling. Ultimately, we help them understand what patients are looking for (the demand) and marry that with high-quality provider data (the supply) to surface where imbalances occur, enabling leaders to prioritize areas for improvement. We are honored to work with so many health systems across the country to empower them with new visibility into their networks and enable their enterprise-wide patient access initiatives. Providence St. Joseph Health, one of the largest health systems in the US, is a prime example. They have not only built an enterprise-wide provider directory with KyruusOne, but are also leveraging our solutions to enhance the patient experience across offline and online points of access. And, we were excited to recently announce that they’re expanding their work with us to include St. Joseph Health. Improving patient access is not an overnight endeavour; it is a multi-step process that requires effective leadership, stakeholder engagement, change management, innovation, and technology. We’re glad to be supporting our health system customers on this journey and to be part of the solution to the patient access paradox. For more information about Kyruus, stop by our booth (#521) at HIMSS Feb. 11-14th, attend our presentation at the AWS booth on Feb. 13th at 5:30pm (booth #5058), or visit us online at kyruus.com.